San Leandro High School, which was placed on lockdown Wednesday after graffiti threatening a shooting was found on campus, will be closed Thursday, according to school officials. Pete Suratos reports. 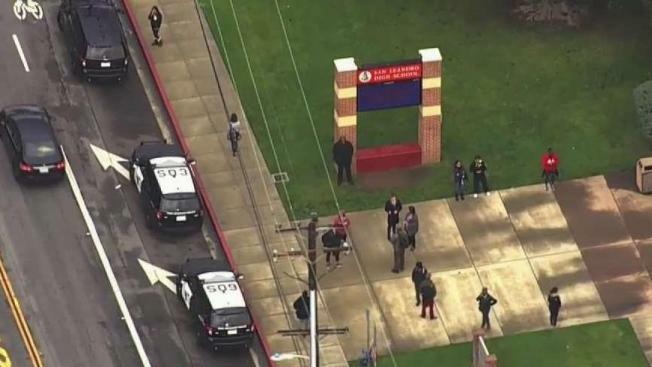 San Leandro High School, which was placed on lockdown Wednesday after graffiti threatening a shooting was found on the Bay Area campus, will be closed Thursday, according to school officials. The lockdown Wednesday was lifted a few hours later after the campus was deemed clear, but school officials decided to close the campus Thursday out of caution because the threat indicated the violence would occur on Thursday, according to Mike McLaughlin, superintendent for the San Leandro Unified School District. "My son text[ed] me and then called me and said, 'Mom, someone threatening to shoot up the school. It's on social media. They got us on lockdown. Please come get me,'" parent Samaya Nu said. After the lockdown was lifted at about 1 p.m., students were dismissed early for the day, McLaughlin said in a letter to parents. The lockdown came at the same time as thousands students across the nation walked out of class to both remember the 17 people killed during last month's school shooting in Florida and speak out against gun violence. Just minutes before the San Leandro High School lockdown was issued, students were photographed holding a sign reading "It Could Be Us Next," according to a student at the school. "We wanted our voices to be heard for the nation wide walk [out] at 10," the student tweeted. "Such irony is sad." John Muir Middle School also was placed on lockdown Wednesday after a "copycat" incident, McLaughlin said. "After a sweep of the school, it was determined there was no threat, and students were released at the regular dismissal time," McLaughlin said. Police said both schools were placed on lockdown as a precaution so that officials could thoroughly inspect the campuses. 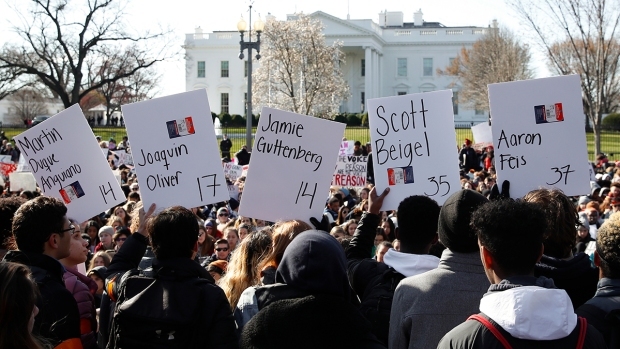 As part of walkouts nationwide on Wednesday, students gave impassioned speeches outside the U.S. Capitol alongside members of Congress. "The adults have failed us. This is in our hands now. And if any elected official gets in our way, we will vote them out," said Matt Post, a senior and student member of the board of education in Montgomery County, Maryland.